The end of the last remnants of CN’s Northern Transcontinental began with a closure of the Smurfit-Stone plant in Portage-du-Fort, Quebec, in the Pontiac Region. The mill closed in 2008, putting 200 people out of work. At one point, the mill employed more than 400 in the Pontiac and neighbouring Renfrew County in Ontario. By 2008, the Beachburg Sub was essentially a sparsely used Upper Ottawa Valley rail line that served what few local businesses still required rail service. Ottawa Central Railway operated over the old transcon, but the economic recession that was in full swing in 2008 and hit the short line hard. The customers along the old sub began to disappear. The Smurfit Stone plant was essentially the last remaining major customer and the rail line’s raison d’etre. The end was nigh for the OCR as the short line struggled to cope with the impact the recession had on what little heavy industry remained in the Valley and in Ottawa. 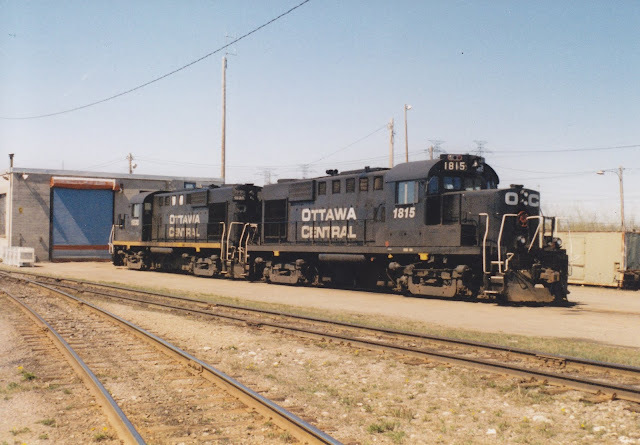 Just days after the mill announced its closure in October, OCR announced that CN would reacquire all of its former Ottawa-area properties from the company that owned OCR. That deal included the 156 kilometres of rails between Ottawa and Pembroke, not to mention the 40 plus kilometres between Glen Robertson and Hawkesbury that was once the Ottawa-L’Orignal Railway (purchased by OCR’s parent company). It wasn’t long before the Beachburg Sub north of Nepean Junction was essentially deemed out of service and put on the chopping block. But the battle that ensued for the rail line meant that the old transcon hung on a lot longer than CN likely wanted. The governments of Renfew County and the Pontiac fought to keep the old Beachburg Sub in the ensuing years. The first move was to organize an entity called Transport Pontiac Renfrew, which was aimed at retaining the rail line and finding a new operator for it, not to mention new uses including commuter rail. OCR co-operated with TPR and ran a special Rail Day commuter train up the Ottawa Valley line, just before CN took over. The double ender included two classic CN coaches painted in the railway’s olive green scheme, with an old OCR geep on each end, like these beauties below. That initiative generated some interest in the media and goodwill. There was an appealing element to having a solid commuter option for residents of the Upper Ottawa Valley who might travel into Ottawa and Gatineau for work. In the midst of this goodwill in the months and years that followed, Renfrew and Pontiac struggled to come to any agreement with Canadian National on a deal that would save the line and help their municipalities find a new operator. It wasn’t until 2009 that it was revealed in the media that James Allen, the former general manager of the OCR, was in fact working closely with TPR to come up with a workable plan to move freight and establish some sort of long-term commuter vision for the Beachburg Sub. I was lucky enough to be that reporter who broke the story in the now defunct OpenFile.ca. At the time, what James Allen told me was a real departure from the dismissive or ambivalent attitude most people have toward railways in the city. Allen pointed out that the Trebio wood pellet plant in the Pontiac was interested in rail service. He estimated that the plant would form the basis for upwards of 800 carloads a year. It wasn’t a huge number by any means, but it was a decent start. Allen told me that the Trebio plant was the anchor in a strategy to develop a rail-serviced industrial park in the Pontiac. What was even more surprising was TPR’s plans to launch some form of commuter service over the old sub as well as tourist and recreational trains up the Valley. It all seemed very positive for Pontiac and Renfrew, two areas that are far too remote to attract large-scale economic development opportunities without this mode of transportation. Unfortunately, not long after I wrote that article, which was not surprisingly dismissed locally, the deal to buy the Beachburg Subdivision fell through. That ended all reasonable hopes for the line to be saved. Depending on who you ask, there are various reasons why the line was ultimately killed. The biggest reason was likely cost. Politicians in the Pontiac claimed that CN had set the sale price well beyond the reach of Renfrew and Pontiac. In other words, it was priced far beyond the scrap value of the line. Surprisingly, the Pontiac region fought on for several more years, even without any reasonable hope of success. The region’s tactic was to pass a local bylaw essentially designating the railway land as a key transportation corridor, which prevented any dismantling. The province of Quebec signed off on the bylaw, but CN fought the move in a higher court and won. In fall of 2013, the last stretch of CN’s Northern Transcontinental route was pulled up from Pembroke to the Pontiac region, but the work was stalled when the region barricaded the tracks, preventing CN crews on a CWR maintenance of way train from stripping the rails. That stand-off was short lived. There was one last-ditch effort to enlist the help of the City of Ottawa, since the Beachburg Sub still connected Fitzroy Harbour, in Ottawa’s northwestern boundary, to Nepean Junction, near Bells Corners. The efforts included enlisting the help of the city’s councillor for Kanata North and for West Carleton, the ridings where the rail line’s removal would happen. Predictably, those efforts went nowhere as the city maintained that it was only interested in the land upon which the tracks sat, for possibly future use as a multi-use recreational trail. That meant that the CWR train made its way into West Carleton and stripped the rails from much of the line, although various scraps were kept in place at level crossings, including one in Dunrobin, which meant motorists still saw disconnected crossing signals for a rail line that no longer existed. By spring 2014, the line was completely dismantled all the way to Nepean Junction. Not long after the last train rolled through with the last bits of useable rail, the switch was removed at Nepean. The last little bit of the Beachburg Sub from Federal to Nepean Junction was then directly connected with the Nylene Canada-owned Renfrew Spur. Today, as CN looks to leave the Ottawa region once more, the rails in the west end of the city continue to exist with a large question mark hanging over them. When CN first proposed discontinuing service to Arnprior, it was Nylene Canada's predecessor BASF that put the wheels in motion to purchase the tracks and continue service. That arrangement continues today, mainly because the company cannot find a way to economically receive what it needs by trucks. The main reason why rail service continues is because the chemical it needs, caprolactum, can only be transported via a specially insulated tank car. As it stands now, there is no way to have the same amount of this product delivered via truck at a comparable cost. For what few rail enthusiasts there are left in west Ottawa, the question of what any future rail operator will do about Nylene Canada is a big one. There's also the larger question of who will step up to provide rail service in Ottawa when CN eventually leaves? It's not a great time to be a railfan in west Ottawa, but that could change in an instant if a short line operator with a vision and a much better understanding of a carload freight based business model steps in to save the rails. And, coincidentally, it wouldn't be the worst thing in the world if a revitalized freight railway could take a few trucks off our congested Queensway. It's interesting that, in a city that struggles to cope with congestion and the onslaught of truck traffic in older neighbourhoods, a simple solution of encouraging a short line railway would go a long way to clearing the air. For Ottawa in particular, encouraging less congestion, especially downtown, is almost an economic necessity since it has a huge impact on the tourist experience. You would think that someone in charge would figure out what a benefit it is to have a healthy freight railway in a city of nearly 1 million people.